Nancy Pelosi is the first female Speaker of the US House of Representatives. She is also second in line of presidential succession, after Vice President Biden. This makes her the highest ranking female politician in American History. She is also one of the most effective and powerful Speakers we've ever had, as she aptly showed last night. These are my favorite quotes from today's news - although there were many to choose from. 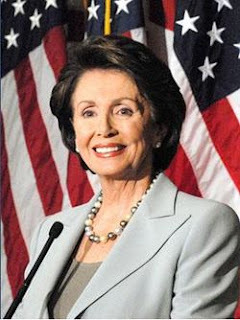 Nancy Pelosi was born and raised in Baltimore in a well known Catholic political family. Her father was a Congressman and Mayor, and her brother also served as Mayor. When she graduated with a degree in political science, she went to work for a US Senator from Maryland. But while she was in college she met and fell in love with Frank Pelosi. When they married, they moved to New York and then San Francisco. Like a good Catholic wife, she stayed at home to raise her five children. But she was an active volunteer for the Democratic Party, working her way up with ladder. One of her mentors was Congressman Philip Burton who served for 20 years until his death. His wife was appointed to his seat, but she decided not to run for reelection and chose Pelosi to run for her seat. Since Pelosi's youngest child was a senior in high school, she felt like she could now run for office. It was an extremely close race, but she won - and has never had a serious challenger since. When she announced her campaign for Congress in 1987, it made the news in Baltimore because of the prominence of her family. I was living in Annapolis at the time and heard the news. The more I learned about her, the more I liked her. I sent her a contribution and have been a fan ever since - closely following her career. Like most women in a male dominated career, she worked harder and more professionally than most of her colleagues - and she gained a great deal of respect from her peers. She served on Committees usually reserved for men - Appropriations and Intelligence - and eventually became the ranking member of the Intelligence Committee. "This is a historic moment — for the Congress, and for the women of this country. It is a moment for which we have waited more than 200 years. Never losing faith, we waited through the many years of struggle to achieve our rights. But women weren't just waiting; women were working. Never losing faith, we worked to redeem the promise of America, that all men and women are created equal. For our daughters and granddaughters, today, we have broken the marble ceiling. For our daughters and our granddaughters, the sky is the limit, anything is possible for them". Nancy, on behalf of all the women to whom you are a heroine, I want you to know we are extremely proud of you! It's incredible she went from a stay at home mom to speaker of the house -- what an amazing woman. We are proud! Makes me sad that people want to admire Pelosi and all of her left- wing, nut- job cronies. She is arrogant, snobbish, brutish, tactless, etc.. Certainly someone to admire. Will be fun to see/read/hear all your collective moaning and groaning when this liberal bunch is moved out in November. Is it possible? As Massachusetts goes, so goes the nation. Yay Nancy Pelosi!! My hero. I do admire her very much. I never thought she'd get that thing passed. Long live healthcare reform. This is funny as hell. Uh, had McCain won, you would have your first female VP who came from NOTHING. Pelosi didn't come from nothing. Palin worked her way up from local politician to governor to potential VP. Her story is FAARRRRR more amazing then Pelosi. But, like any true left wing female, only liberal women seem to be heros to women rights groups. Uh, Condi Rice comes to mind....a wonderful woman. Pelosi's approval rating is in the tank. Sorry, bribing members of Congress for a vote on anything is sick. But Sarah Palin is an idiot! what's the point of having a female VP who is an idiot? I don't want women in office just because they are women if they will set back our cause. I journey here to find information, and clarity on health care reform, and find I can also salute Nancy Pelosi, and I do! I agree with you, Elizabeth, what part of "we'll gladly vote for a woman...a smart woman" is hard for some to grasp? Am wondering why the most bellyaching Conservatives don't just lay the cards on the table, and they are: This isn't about health care, this is about losing, and not being in charge, and not being able to move forward and do the work necessary for the people. Is this Mickey Mouse macho-ing going to go on forever? Sorry the American people are actually slightly on board with the Repubs right now. This has NOTHING to do with the things you mention, that is nothing but left wing crap. This has everything to do with unprecedented abuse of power and the folks are sick of it. If Sarah Palin is an idiot (a myth forced on us by the media) then OBAMA is a complete dunce and Biden is his teacher. He claimed he visited 52 states. PALIN has NEVER said anything as stupid. Biden has become a nightly punchline. Reading elegantly from a teleprompter does not make one a genius. How about Harry Reid who mistakenly just voted NO on healthcare... NOT ONCE but TWICE. IDIOT! Sorry Elizabeth but you summed it up by referring to "your" cause. It's not that Sarah Palin is an idiot, it's because she's a conservative. OK Mint Julip, I challenge you. If Condi Rice (smarter than any woman you can mention) ever runs for office, then by your words you will gladly vote for her. Doubt it but nice try. Some of you should read liberal writer Camille Paglia of Salon. She explains how Sarah Palin did more for the womens movement than any woman in recent history but because of the womens groups BLIND ideology they completely disregard her and what a shame it is. Your ramblings do amuse me, Art..one crow for mirth! I do not believe either of us will see Ms. Rice's name on a ballot; having aligned herself with Bush/Cheney as they led us into war w/false claims has insured that her future will be much the same as theirs. Pelosi is worth every bit of praise she gets. Her achievements are especially noteworthy in that they were accomplished by a senior citizen without gaining gray hairs, facial lines, breast droop and neck sag -- and the massive eye bags developed by her second-in-command, Steny Hoyer. Every great tapestry has a flaw. Pelosi's is her seeming inability to age naturally and honestly. Perhaps it takes a huge ego to do a huge job. False claims???? You work with the info you receive. Every country on earth, besides the USA, believed Iraq had WMDs based on intelligence. We could argue that all day. Regardless, at least that vote was bipartison unlike the health vote. "Thank you very much for your personal testimony. I too have been repulsed by the elitist insults flung at Sarah Palin in the massive, coordinated media effort to destroy her. Hence I have been thoroughly enjoying the way that Palin, despite all the dirt thrown at her by liberal journalists and bloggers, keeps bouncing back as if unscathed. No sooner did the gloating harpies of the Northeastern media think they had torn her to shreds than she exploded into number one on Amazon.com with a memoir that hadn't even been printed yet! With each one of these amusing triumphs, Palin is solidifying her status as a bona fide American cultural heroine. Yes, the snobbery about Palin's five colleges is especially distasteful, given the Democratic party's supposed allegiance to populism. Judging by the increasingly limited cultural and factual knowledge of graduates of elite schools whom one encounters working in the media, blue-chip sheepskins aren't worth the parchment they're printed on these days. Young people forced through the ruthlessly competitive college admissions rat race have the independence and creativity pinched right out of them. Proof? Where are the major young American artists, writers, critics or movie-makers of the past 20 years? The most adventurous and enterprising minds have gone into high tech. We're in a horrendous cultural vacuum because our status-besotted education industry is geared toward producing not original thinkers but docile creatures of the system." What future are you referring to when talking about Rice aligning herself with Bush.....uh, winning a second term in office???? Gee, I wonder why Obama hasn't pulled the plug in Iraq like he said he would......maybe he saw the intelligence report. Whether Palin is an idiot is arguable, but she is ignorant in the classic sense of the word. She lacks the knowledge base and wisdom to manage a nation. If she wants to be president, she should be back in college, cramming knowledge fit for a president, not for a sportsreader. Instead, she quits the job that was giving her a smidgen of governing experience and is on the road maximizing her earnings. She has become the celebrity politician her fans accused Obama of being during the 2008 campaign. Actually, Palin needs more than knowledge. She needs therapy to counter the catatonic, depressive behavior described in Game Change. the simple fact that Palin can give a good speech without the use of a teleprompter at every turn tells me she's slightly more intelligent than your ivy league educated fraud that is Obama. It's strange to me that you guys think Obama is a genius based on nothing more than arrogance but Palin doesn't disclose to left leaning CBS news anchor Couric what newspapers she reads, well, oh my she's an idiot. Every time Biden opens his fat trap he vomits idiocy and he's the freakin VP. Obama claimed to visit 57 states with 2 left to go, IDIOT. Reid mistakenly voted NO twice on his on health care bill....idiot. Here is Pelosi's quote on the health bill....."But we have to pass the bill so that you can find out what is in it, away from the fog of the controversy." WOW. I agree, Cloud, she is ignorant. And should by this time have completed her 15 minutes of fame. Her admirers are like her, not wise and suffering from sore loser hangovers. But actually, it does not matter who or what she is, she's not an elected official and has zip impact on any aspect of my life, Thanks be to God. Now that we have intelligent and logical people in the Oval and surround, I sleep much better nights than I did during the Eight Years of Uncertainty and Spending on Invasions. I don't care for Sarah Palin or Nancy Pelosi, and I usually don't interject into arguments between those caught up in the left- right paradigm who give no credence to natural rights or constitutional government, but I noticed something above that made me need to interject. Where are all of the people on the left who criticized Bush for his unconstitutional military actions now that Obama is in office? Since taking office, he has increased the troops in Afghanistan, sent drone missile attacks into Pakistan and Yemen, and bombed Libya without any congressional debate. Makes me sick... and stomach aches can't be cured by Obamacare.